Eye sailing again with the friends? Naturally, people on the ship kept coming and going. First, the voyage crews need to go home every now and then to make more money for the next trip. Second, even the permanent crews cannot stay permanently for different reasons. Some kept returning to the ship like the paying guests did, some where blown into different ships and harbours of the planet. So this is the picture of a moment, a moment of some months I suppose. 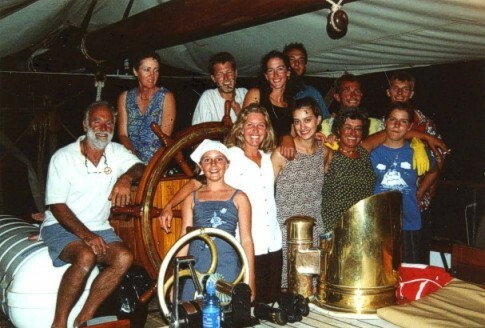 This picture was done early 2001 off Granada in the Caribbean. From left as far as I know them: Tiger, Debra, Tony, Emma, Bronwyn, Laura, Peter (? ), Gwenyth, ?, Jill, ?, ?